If you’ve ever backpacked, you’ve probably had occasion to turn up at some far flung destination with no accommodation booked, to then have to search for a bed in earnest. Such was the situation that had befallen a Swiss couple that I’d met today. Like me they had arrived in Bandung, some three hours east of Jakarta, the night before, but unlike me they had no accommodation booked. They searched for some two hours, and on their twelfth attempt, finally settled on their first available option. However all was not as it seemed. For having been allocated a room on the karaoke floor, it became apparent that whilst I was staying at a business hotel for business travellers, they were also staying at a ‘business’ hotel of sorts. Throughout the night, they were kept up by the raucous singing of the drunken men and working girls. To add insult to injury, the room was only barely clean; the shower water was a little bit brown and only lukewarm; and the spaghetti bolognaise churned out by the hotel restaurant consisted of noodles with sliced vegetables and sweet and sour sauce. We had met as all three of us were headed on a day tour of one of the tea plantations in the Bandung vicinity, to be followed by a visit to Volcano Papandayan. On the advice of the tour operator through whom I’d booked this tour, I indulged in a hearty breakfast to prepare for the day’s adventures. As a hotel catering predominantly to Indonesian business travellers, the breakfast was Indonesian as expected. On the serving table were mie goreng (fried noodles), nasi goreng (fried rice) and Indonesian congee. 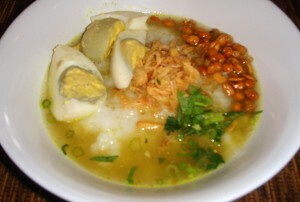 Like Chinese congee, the Indonesian version was made from rice, but unlike Chinese congee, this was much thicker and laden with stock. The stock tasted as if from packet mix, but with a good quality broth, no doubt would have been delicious. You could also garnish it as you liked, with peanuts, fried spring onions, etc. Perhaps the idea of noodles, rice and congee for breakfast doesn’t cater to every Western palate, but I guess it certainly caters to that of Indonesian business people.